Did you know that Midd Libraries provides the entire Middlebury community with access to thousands of movies, all available to stream instantly? Kanopy is something like an academic version of Netflix: a carefully selected and curated collection of more than 15,000 films, spanning the breadth and depth of personal and scholarly interest. Independent movies, international films from every continent, arthouse cinema, early cinema, documentaries on thousands of topics, plus instructional and scholarly films. The collection brings together selected films from the Criterion Collection, PBS, BBC, Kino Lorber, and hundreds of other providers. You can search for specific films in Kanopy through Summon by filtering results to display only video recordings, or you can browse the entire collection at go/Kanopy/. 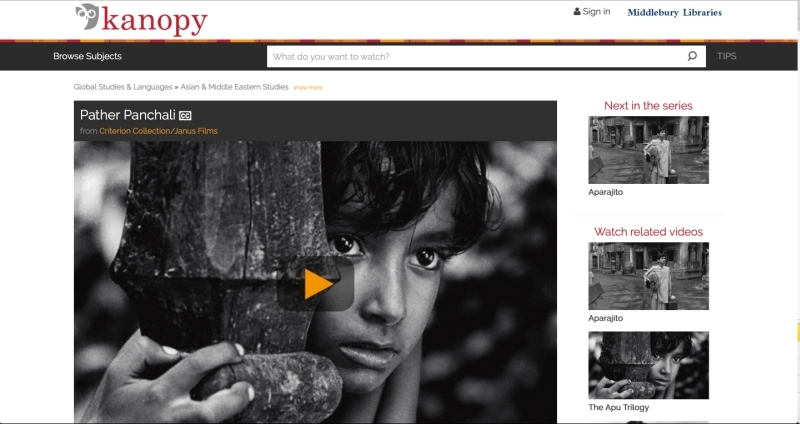 Whatever your area of interest, Kanopy is great for research, instruction, or entertainment! I am not a matriculated Middlebury Student. I am auditing Professor Goldman’s Course on the Ten Commandments. Is it possible to have access to Kanopy? Unfortunately, our license agreements only allow us to provide off-campus access to Kanopy for enrolled students, staff, and faculty. However, if you come into the library, you can use virtually all of our subscription resources, including Kanopy. Hope this helps. Thank You for your reply. I was in the library for the first time this week to attend a class in the special collections room. What a privilege!